This album brings back a lot of memories. Gil Evans was one of the finest composers/arrangers in the years leading up to, during and beyond the big band era; Claude Thornhill, with whom Evans worked for many years, led one of finest of those bands. 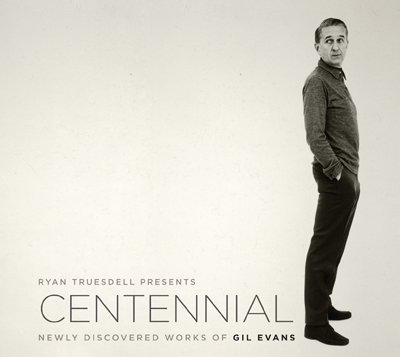 producer Ryan Truesdell has spent much of his life studying and researching notable jazz artists such as Evans; Centennial is his most recent project. I lived through the decades when Evans and Thornhill reigned supreme, so this album has a special meaning to me. But it’s even more special, because the Evans tunes here never were published or recorded previously: Everything old is new again. The detailed liner notes discuss the songs superbly, so I won’t be repetitious; suffice it say that Truesdell has uncovered a musical treasure trove, and also has assembled an orchestra that does full justice to this discovery. Since Evans wrote most of the “book” for Thornhill’s band, some background is warranted. Thornhill’s ensemble was different than the other bands of that era. As one of his ex-musicians put it, “he wasn’t a swing band, he had an orchestra.” Thornhill’s instrumentation included French horns, tuba and a clarinet “choir,” and he wanted his musicians to play “without vibrato.” The result was a smooth, at times “pretty” tonal quality. Evans was partly responsible for that; he specified such instrumentation additions. But swing entered the scene in later versions of the orchestra, which utilized bebop disciples such as Red Rodney, Lee Konitz and Gerry Mulligan. Another factoid: Evans was a huge fan of Miles Davis. It’s not widely known, but Evans did the arrangements for four of Davis’ best known albums: Miles Ahead, Porgy and Bess, Sketches of Spain and Quiet Nights. That alliance is evident in everything Evans wrote. Centennial’s discoveries include 10 gems that represent Evans’ best, and clearly demonstrate that he was in a class of his own. As for Truesdell’s orchestra, it’s huge and magnificent. The woodwind section consists of 13 artists, including oboes, bassoons, flutes, clarinets, English horns and piccolos; the brass section numbers 10 and includes trumpets, trombones, French horns and a tuba; the nine-man rhythm section features piano, bass, drums, two guitars, timpani, vibraphone, tenor violin and tabla. Finally, three vocalists split duties on the tracks with lyrics. This is a stupendous album that deserves a “best of the year” award. When you listen, you’re in the company of geniuses. Holiday Jazz 2012: Swing Ye Noel!